Want Free MLB SportsClix Figures? Get in the game with MLB SportsClix! The hottest baseball game of 2004 is exploding at hobby and gaming stores everywhere. Collectors love the finely-detailed figures and players love the accurate game mechanics and real-life statistics. Now, starting your MLB SportsClix collection has never been easier. 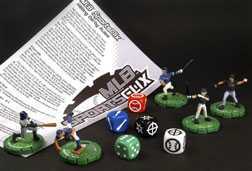 Go to www.beckett.com to order five MLB SportsClix promotional figures FREE with custom playing dice and a set of short rules for $1.99 shipping and handling. And once youve honed your skills, go to www.wizkidsgames.com and click the "Events" tab, to find an MLB SportsClix tournament near you. Collect all 198 figures found in Starter sets and Booster packs at a hobby or gaming store near you!